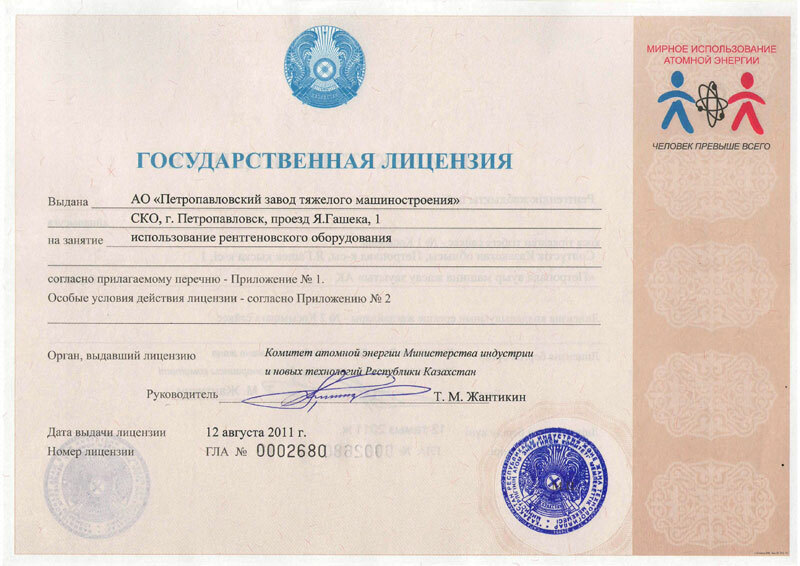 ﻿ JSC "Petropavlovsk Plant of Heavy Machine Building"
The enterprise has all necessary licenses for all types of released products manufacturing. 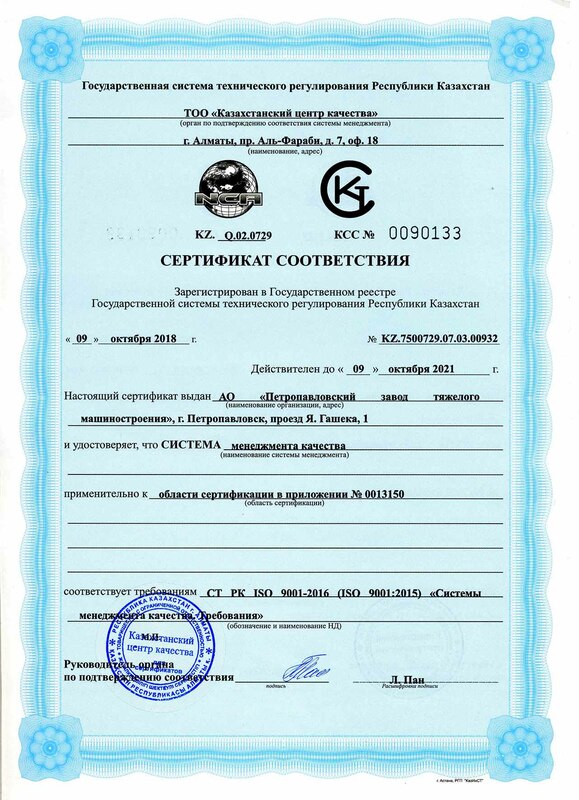 State license №002896 dated 16.06.2009 to projecting, manufacturing, assembly, overhaul of chemical, drilling, oil-and-gas field, geological, mining, power equipment, lifting units, boilers, pressure vessels and pipelines (issued by Kazakhstan Ministry of Energy and Mineral Resources). 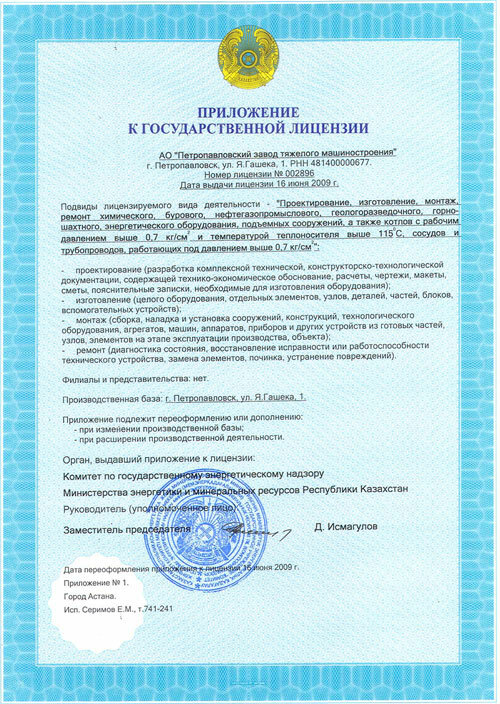 State license for x-ray equipment applying № 0002680 dated 12.08.2011 (issued by the Committee of Atomic Energy of the Kazakhstan Ministry of Industry and New Technologies). 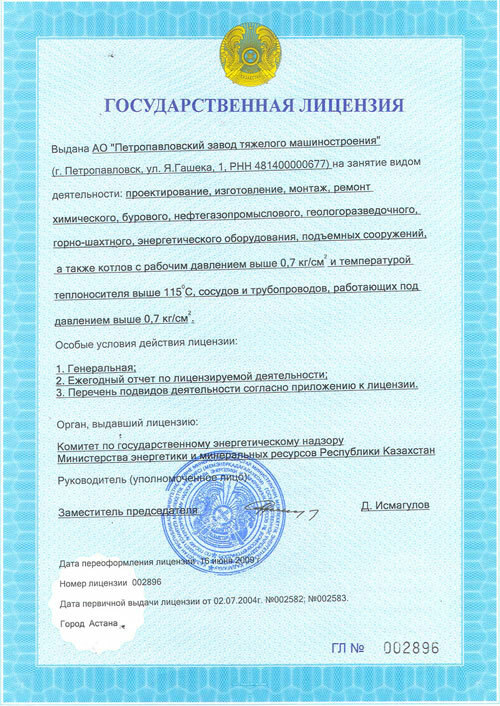 In April 2003 “PZTM” JSC has been certified by TUV CERT “TUV Thuringen E.V.” company. Quality management system was developed and implemented in accordance with the requirements of the state standard STRK ISO 9001-2009 and international standard EN ISO 9001:2008. 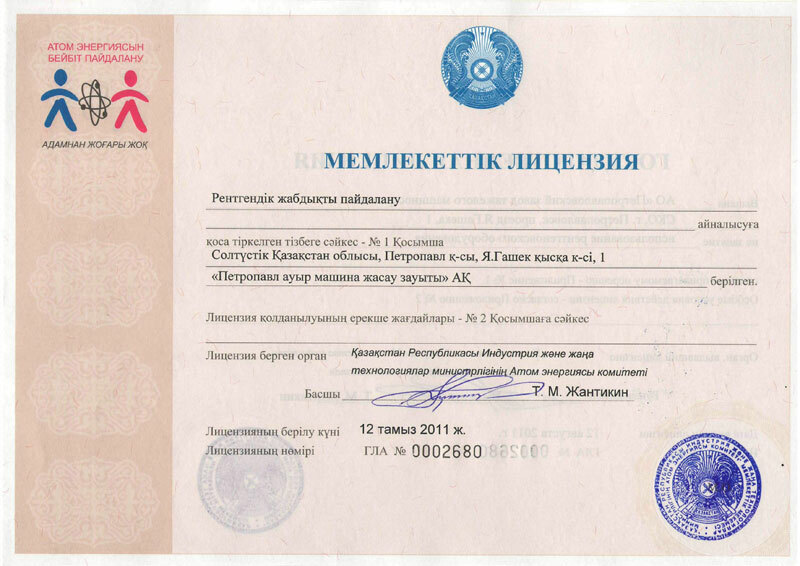 Since 2007, our oil-and-gas extraction equipment has been certified for industrial application in Russia. Specialists of the Russian oil companies appreciated the enterprise’s activity. 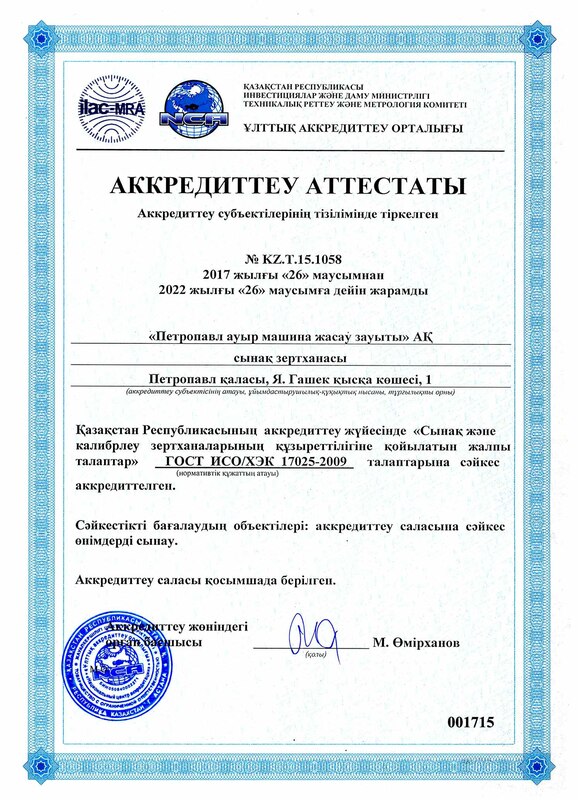 Plant’s testing laboratory has been certified in Kazakhstan’s accreditation system for compliance with ST RK ISO/IEC 17025-2007 “General requirements to the competence of testing and calibration laboratories”. 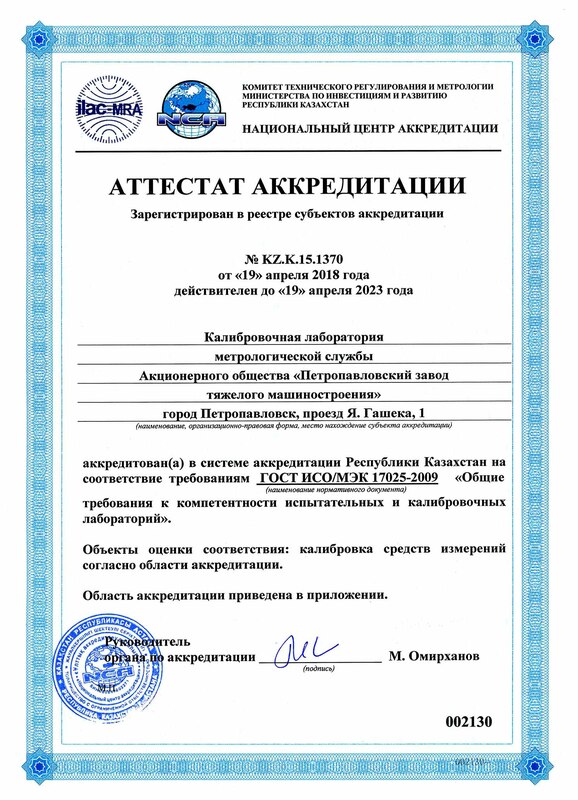 The National Accreditation Center of the Technical Regulation and Metrology Committee of Kazakhstan Ministry of Industry and New Technologies issued an accreditation certificate No. 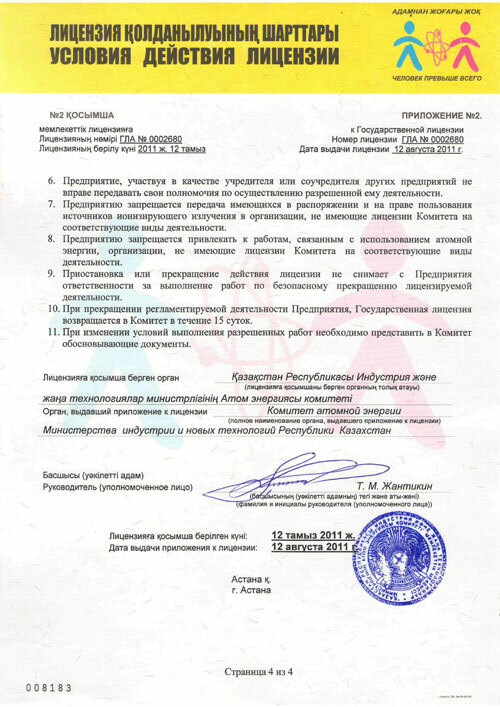 KZ.I.15.1058 dated 09.12.2010. Accreditation of testing laboratory and metrology service allows to carry out certification works of all types of products at the site. Verification and certification of calibration and testing means, as well as measuring instruments, subject to state metrological supervision, is organized and carried out in accordance with the agreements signed with the affiliates of "National Centre for Expertise and Certification" JSC. 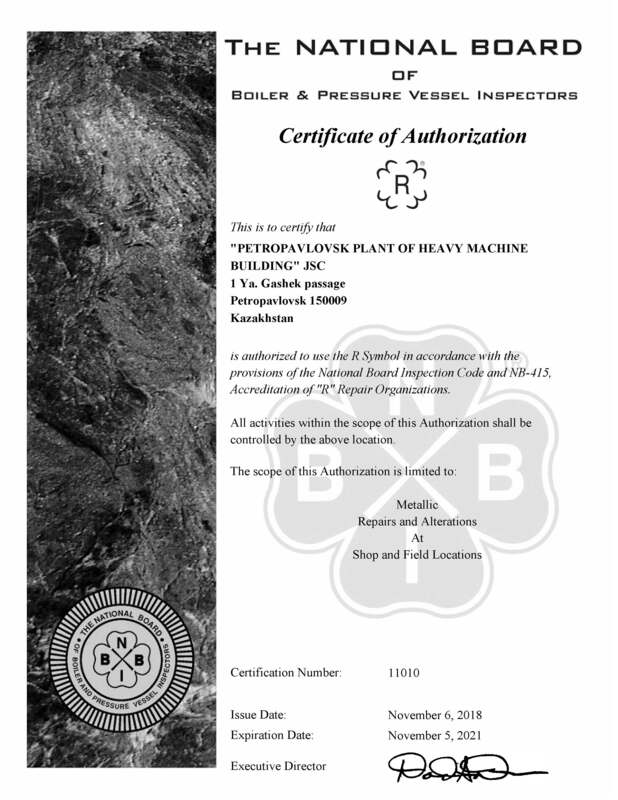 In 2006, the company developed, implemented and certified a quality control system for manufacturing boilers and pressure vessels in accordance with the requirements of International Standard ASME CODE (SECTION VIII DIVISION 1) with the right to apply the “U” stamp. Due to the absence in contracts of requirements for “U” stamping of manufactured products and its lack of demand, the validity period ended in 2009 and was not extended. According to the ASME rules, “U” stamp and the Certificate of Authorization (# 36, 001 dated July 21, 2006) returned to USA (New York). 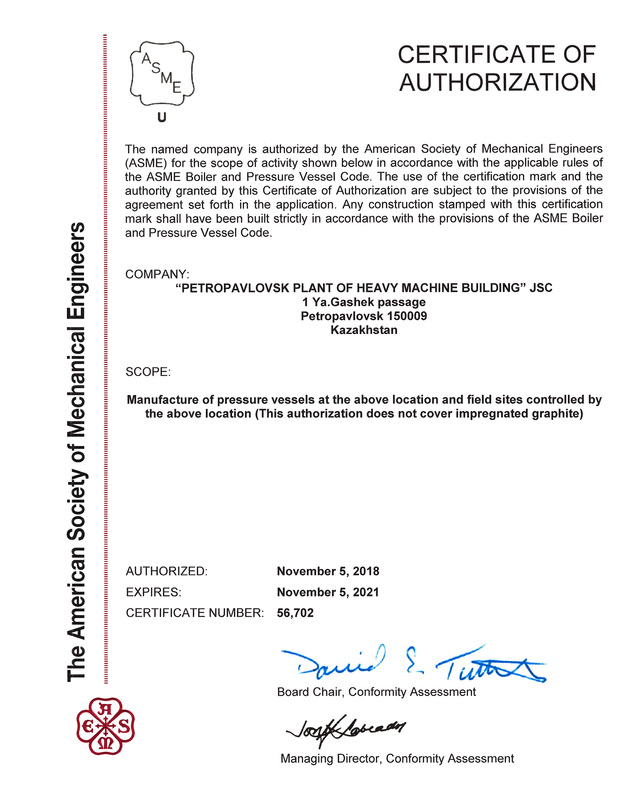 In 2018, PZTM JSC has successfully passed certification for compliance with the requirements of the ASME Code standard and has been authorized for application of “U” and “R” stamps.